This pasta salad is packed with beautiful Mediterranean flavors, including briny olives and creamy, salty feta cheese. Start by seasoning halved cherry tomatoes with salt and pepper. Then cook farfalle pasta according to package directions. 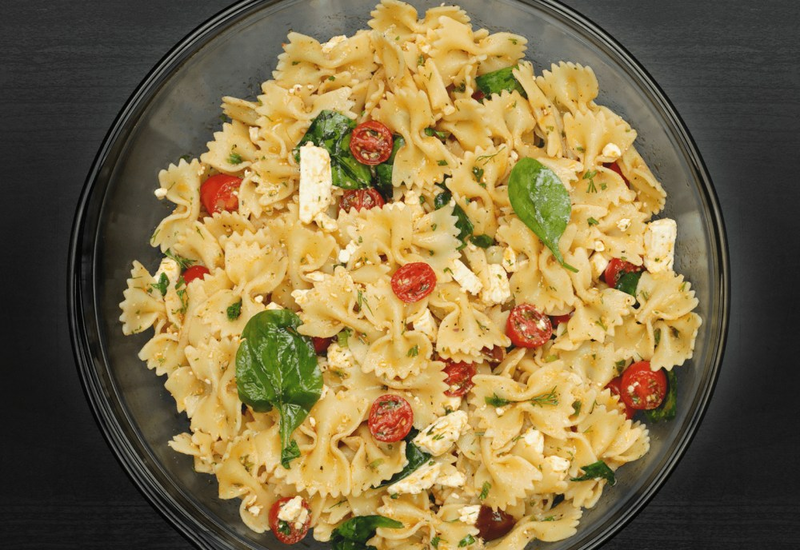 Finally, just toss the pasta and tomatoes with spinach, olive oil, green onion, lemon juice, parsley, Kalamata olives, fresh dill, garlic, paprika, and feta cheese. Refrigerate until ready to serve and enjoy cold. This is a great pasta salad for a picnic! Farfalle are a type of pasta commonly known as bow-tie pasta. The name is derived from the Italian word "farfalla" meaning butterflies! Double or triple the amount of spinach to make this pasta salad lean a bit further in the salad direction. Per Serving: 234 calories; 12g fat; 26.4g carbohydrates; 6g protein; 6mg cholesterol; 130mg sodium. This was great! I brought it to a cookout the next day and people loved it. This has become one of my favorite pasta salads. When the feta meets the olives and tomatoes nothing but joy for my tastes buds. My fiance really liked this dish and he hates olives! The overall Mediterranean flavor is sensational. Loved the combo of all the fresh spices, feta and lemon for a little zest. We're trying to be a little more carb conscious so I subbed about half the noodles and added more spinach as suggested. I skipped the dill and paprika, only because I didn't have any on hand. This pasta salad was amazing. So easy and minimal ingredients. Perfect for casual gathering or work potlucks! I used zoodles instead of pasta and got the same effect. The olive oil kind of acts as a light dressing, which was perfect for tossing the zucchini noodles in. Light, delicious, and easy. Perfect for lunch or entertaining!